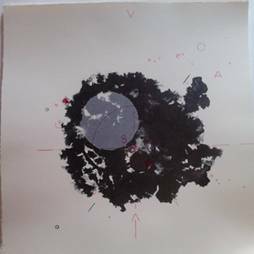 Estampació a tres colors i collage, a partir de tres pedres litogràfiques dibuixades per l'artista en el taller de Carles Monegal a Tremp la primavera de 2015. La impressió s’ha realitzat en aquest taller l'hivern de 2015 sobre paper de 250 grs. Súper Alfa, 100 % cotó, de la casa GVARRO i amb tintes Van-Son i Graphic Chemical. Three colors lithograph and collage edition of three stones drawned by the artist at Carles Monegal Workshop in Tremp (Spain) during spring 2015. The edition was printed during winter 2015 on the same workshop on 100% cotton paper (GVARRO, super alfa, 250 grs.) with Van-Son and Graphic Chemical lithographic inks. The edition consists of 50 lithographs signed and numbered from 1 / 50 to 50 / 50; 5 artist proofs (A.P.) signed and numbered from I / V to V / V; 2 workshop proofs (P.T.) signed and numbered and 1 “bon à tirer” (B.A.T.). All litographs are 30 X 30 cm. and bear the Carles Monegal printer and workshop chop (blindstamp).